This is the original draft, with George’s markings on it, of “Contelli’s Mimosa,” which later became BENEATH THE MIMOSA TREE. This story begins back in 1992, as I was finishing up my master’s in professional writing at Towson University. I decided to take Writing Short Fiction as my final class—an elective of sorts—in the Professional Writing program. I had selected the public relations track, so this class was taken for fun. I had taken Creative Writing in high school, and had loved it, so I decided to give it a try. Enter Dr. George Friedman, the professor. His teaching style was one that, to this day, some twenty years later, I try to emulate in my own classroom. There we were, all of us students writing stories, and George would ask us questions, make us think, make us re-evaluate why our character did what he did or said what he said. He made you want to work hard on your writing. I fell even more in love with creative writing that last semester, and I definitely loved George. 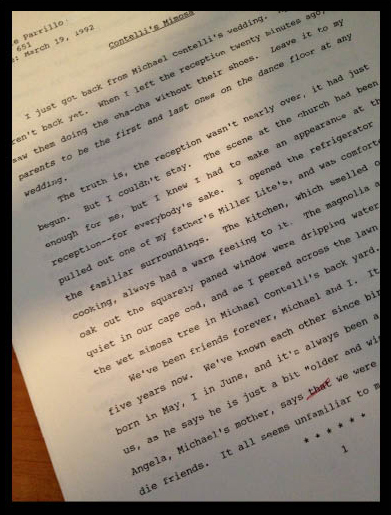 I kept thinking—how ironic that through this very last class and after eight years of higher education—I reconnected with creative writing, something I wanted to do for me—because of the profound influence George had on me. You see, it was George who read my piece of short fiction entitled “Contelli’s Mimosa,” a short story about two people who grow up next door to each other, find love, and then lose it. George and I had stayed in touch, even through my time at the Orioles. When the Cal Ripken Commemorative book was published and I was the editor of it, George sent me a copy of the book to sign. After I left the Orioles, George and I lost touch. This past March, I published the novel that George encouraged me to write those many years ago. It’s now called, of course, “Beneath the Mimosa Tree,” and it was completely rewritten, but always with George’s kind words reminding me that I can and should do it in the back of my mind. I did it. I thanked George in my acknowledgements in the book. However, I didn’t know how to reach him to send him a copy of the book. I was at the Baltimore Book Festival three weeks ago. I was talking with people in the author’s tent, when a lovely lady named Dr. Marilyn Nicholas noticed on my sign that I went to Towson University. She is Professor Emeritus and Lecturer at Towson, and we began to have a lovely chat. She even bought my book (so sweet). Then, I asked her a question. “Do you happen to know Dr. George Friedman?” I asked. “Yes, of course! His wife is one of my dear friends,” she said. “Where is he? I’ve lost track of him after his retirement,” I said. “He’s in Towson in a new high-rise,” she said. I was glowing. I couldn’t stop smiling. I grabbed a book and signed it to George. Dr. Nicholas did indeed give it to George. And George read my book. This story has come full circle. Sometimes teachers don’t know what a profound influence they have had on you. The truth is, if George had never uttered those words to me, who knows if “Beneath the Mimosa Tree” would ever have come to fruition. So, to wrap this up, here’s what George wrote to me just yesterday in the comment area on my blog. Even all these years later, all I can say is, I’m glad I pleased the professor. 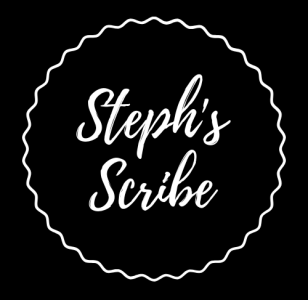 I’m sure this wasn’t the right place to put this, but I tried stephanieverni.com and my computer wouldn’t send it to that location. I wanted to tell you how flattered I was initially, when I read your inscription and acknowledgments. Then I READ Beneath the Mimosa Tree and realized how little credit I deserved. It’s an AMAZING first novel–the characters are so flesh-and-blood, Michael and Annabelle are so endearing I found myself DELIGHTED at the end–even though I understood perfectly why Annabelle was so reluctant ten years before. I’m very proud of you, undeserving though I may be of your thanks, and I look forward to reading more. I know! I am very thankful! I know, Seb, it’s TOTALLY COOL and it made my day!!!! 🙂 Thanks for reading about it! That’s awesome, Stephanie! That was the lady you were talking to when I came up. I’m so glad you were able to get the book to him. Yes, that’s the lady! Baltimore Book Festival was good to me in so many ways…Next year, I want to be on your panel!!! I took a novel class with Dr. Friedman many years ago and it was lots of fun. He had a classroom named after him in the University’s liberal arts building. I hope he’s still enjoying his retirement. Nice story. How wonderful that we both share a great deal of respect and admiration for George. He is the best of the best. And I did learn about the dedication after it happened. I wish I could have been there for it. 🙂 Thanks for popping in to read this. It makes me want to repost it. I’m so glad that all of that happened!!! Unfortunately, not all of his students were so lucky. Personally, I was all set to be an award winning novelist or at least a screen-writer, but he derailed me completely. When I saw him own the room in just seconds…..I mean it only took two dry comments and a handful of photocopies. Maybe a little chalk. I blame him for this teacher’s salary, frankly, and for the fact that despite decades that have passed, I can’t shake my desire to be just like him.